Philippe Cote made around thirty films between 1998 and 2016, that have been screened in festivals as well as various places in Paris, France and abroad. He has been an active member of the coop l'ETNA, an artisanal laboratory founded in 1997. 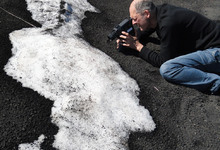 This filmmaker, both radical and sensitive, has mainly worked on the subjects of body, matter, light and color through various techniques, from film without camera to artisanal re-filming and film-painting. His cinema has been more focused on a poetic approach to documentary film from 2006 onward.